If you have been following knife trends at all, you will know there is big interest in both titanium framelock flippers and traditional folding knives. So it shouldn’t take a rocket scientist to come up with the idea of combining these two trends, but they have really been viewed as two mutually exclusive phenomena. That is of course, until now. Enter the Boker Plus Urban Trapper. Designed by fellow Floridian and custom knife maker, Brad Zinker, the Urban Trapper is exactly what it sounds like: the melding of a traditional trapper pattern with modern features and materials. The end result, is everything you love about traditional folders (their light weight, and wickedly thin blades) combined with the bells and whistles of a titanium framelock flipper. It sounds great, but given Boker‘s quality control issues some might pass this model over. That would be a mistake. This is arguable the best knife I have handled in 2015. No joke. Boker has had a spotty history with quality control, and their titanium framelocks have been notoriously bad, so I probably have my work cut out for me if I am to try and convince you that this is the best production knife I handled in 2015, but they absolutely slammed this one out of the park. Let me explain to you why. The Urban Trapper has an overall length of 7.75″, a 3.5″ blade, and the all titanium version (shown here) weighs a mere 1.78 ounces, is made in China, and currently retails for around $60. The knife is insanely light yet still packs a healthy 3.5″ blade. I am not one to bother with blade to handle ratios, but Brad used up every spare millimeter when cramming the blade into the handle. The end result is both thoughtful and elegant. The Urban Trapper was designed to be an Every Day Carry (EDC) knife, and I have used mine in that capacity. Although the blade is on the long side, but it’s thin profile means I have not had any issues using the Urban Trapper in public. I think you could also argue this is a gentleman’s folder. The blade of the Urban Trapper is an elongated clip point, featuring a lean clip with a thin swedge. It is definitely a modern take on a classic blade pattern, and isn’t your grandpa’s clip point. Most of the spine is taken up by the swedge, but the part that isn’t is capped (rounded). The blade has a high flat grind and precise tip. I have always found clip points to be utilitarian, and this version is no exception. The tip is excellent for detail work, and the thin grind slices like a traditional folder (meaning, it slices wonderfully). An interesting detail on the knife is the satin finished blade. If you watch YouTube knife reviews of custom folders, you will invariably hear the reviewer go on about how the knife is “the best flipper I have ever handled” and/or gush over the “hand rub satin finish”. While I think both of those reviewer tropes are more than a little tired, I can’t deny that the blade is well done and the satin finish, running horizontally from ricasso to tip, was intended to mimic the hand rubbed finish of a custom offering. It’s a nice touch, especially at this price point. Boker went with VG-10 steel for the blade, a middle of the road Japanese stainless. I don’t mind VG-10 on this knife given the price point. I have used my Urban Trapper quite a bit, and have had the chance to test it on a variety of materials. It’s great for breaking down boxes, and slices apples with ease. Speaking of slicing, the thin flat grind is a tremendous slicer, much like many of the traditional folders I have used like the Indian River Jack or Alox Cadet. The UT also held up well as a utility knife. I have used the knife for several home improvement projects, cutting thick plastic and even wire in a pinch. I don’t recommend cutting wire with the Urban Trapper, but I didn’t have anything else on me at the time. The knife held up fine, although the edge definitely rolled. VG-10 will not hold an edge forever, but it’s an easy steel to sharpen. No issues with rust, and I routinely rinsed the knife out in the sink after using it. There are a surprising number of details to enjoy when examining the handle of the Urban Trapper. The handle is comprised of 2 pieces of titanium and a single stand off. All of the edges have been neatly rounded, and a series of holes have been drilled into the handle to provide visual interest and lighten the knife. The holes are countersunk and the edges have been given a mirror polished edge. Everything has been executed flawlessly. There is a nice decorative pivot, and the seat of the pocket clip is inlayed into the handle. The titanium is given a tumbled finish which hides wear well. For a simple slab built handle, Boker did a lot to bring Zinker’s custom design to life. If naked titanium is not your thing, Boker is also offering the UT with a variety of handle covers including Cocobolo, G10, and carbon fiber. I haven’t checked these out yet and prefer this minimalist version. The Urban Trapper is a thin and lightweight knife, but it’s not cramped for space. I am able to get a comfortable grip on it without any issues. That said, there is not much in the way of traction on the handle. The stonewashed finish offers a little feedback. There is no jimping. It would not be my go to knife for a 3 month expedition through the Amazon, but it’s fine for urban EDC. I would suggest using this knife the same way you would use a slip joint. That said, I have gotten a lot of work done with the UT and I can say with confidence that this knife is comfortable for normal use. The Urban Trapper comes with a nice fold over deep carry titanium pocket clip. The handle has been milled so the clip slots in to it and is held in place with 2 flush mount screws. This is nice because there is nothing for your pocket to get caught on when you insert the knife into your pocket. The drawback is that the knife is set up for right side tip up carry only. Not a big deal for me, but worth mentioning. The UT carries well. At under 2 ounces you quickly forget it’s in the pocket. The knife is wafer thin and the clip is very unobtrusive. This is a fantastic knife for my style of daily carry. The flipper tab on the Urban Trapper may take some getting used to. It’s squarish and has jimping, and I find that the knife opens best when you “light switch” the flipper by resting your index finger on the corner of the flipper tab. Personally I never had any problems getting the knife open, and I am able to push button the flipper too, but in reading up a bit for the review I noticed some people complain about the flipper. It works fine for me. The detent is solid and the knife is on a bearing system. It flips well, and fires hard. The action is smooth to the point where I can shake the blade closed. For lockup we have a simple titanium framelock. There is no steel insert. Just simple titanium on steel. My knife locks up early (around 20%) and is secure and without play. This is after opening the knife hundreds of times and beating on it in a series of little remodeling projects. I realize Boker does not have the best track record with their titanium framelocks, but this Urban Trapper is trouble free after a couple months of use. I plan on keeping the knife and will update the review if anything changes. Blade centering on my knife is basically perfect. The pivot has loosened up a couple times, but a twist of my allen wrench brings things back to true. Although I think it was released in 2014, the Urban Trapper is on my short list for “Best Knife of 2015”. For $60 I consider it a production folder masterpiece, blending two of the current hottest trends in knives while coming in at the notoriously tough $50-75 price range. When I first got the Urban Trapper I immediately compared it with another favorite of mine: the CRKT Swindle. The knives share some similarities: they are slim, inexpensive, bearing equipped framelock flippers. The Urban Trapper sells for twice as much, but I think it’s twice as nice of a knife. It’s much lighter and the pocket clip is way better. Well worth the price premium in my book. And let me attempt to put any quality control fears to rest – my Urban Trapper has been problem free, and that seems to be par for the course based on my research. The fit and finish is excellent. There is no blade play, lock rock, or anything like that. Say what you will about Chinese knives, but this one is dialed in. The Urban Trapper truly is a combination of the things I love most about traditional folders (their pocketability, people friendly profile, and thin blades) with all of the creature comforts we have come to know and love with framelock flippers (one hand opening, pocket clips, lightweight materials). For $60 it’s a no brainer. The Urban Trapper comes with my highest endorsement. It easily makes its way onto my best EDC knives page. There are nicer more expensive knives out there, but the Urban Trapper is a perfect storm of price, workmanship, and performance. This is something everyone can appreciate. Buy it and enjoy it. You can thank me later. 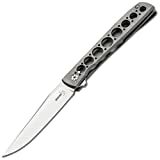 I recommend purchasing the Boker Plus Urban Trapper at Amazon or BladeHQ. Please consider that buying anything through any of the links on this website helps support BladeReviews.com, and keeps the site going. As always, any and all support is greatly appreciated. Thank you very much.